Continuing my experiments in cooking with dandelions, I decided to try this recipe, shared by Gen, author of the guest post on suburban gardening, for fried dandelion blossoms. First, you collect the blossoms! Dandelion stems are very bitter, so you cut off all the stem, leaving only the flower (plus green flower bit/thingy underneath it, so that the flower holds together!). Then, rinse the blossoms in lightly salted water. Pat them dry on paper towels. For the batter, mix 1 cup flower, 1 cup milk, 1 egg (beaten), and 1/2 teaspoon salt. And fry them in hot oil! We didn't *quite* put enough oil to make them deep-fried, but you do need a fair bit of oil. Blotting off any extra grease is always important when frying things, I find. Annnnd here is the finished product!! They were great! A lovely, fluffy texture and simple but good flavour. We didn't feel a need to put anything on them, and just ate them plain! "Going against the middle class/mainstream entrenched believe that to have a successful life you have to get higher ed can you define your idea of what success means?" To me it's quite simple: success to me means nothing more or less than being happy. I find it pretty hard to comprehend how EVERYONE can not see this! Nothing really matters if you're not happy, or working toward finding a place in your life that brings you happiness. What's your goal in life? Aside from happiness, what important thing do you want to do before you die? Does that explain things better? I hope it does. Cameron Lovejoy: "Is this what I want to be doing the day I die?" Eli Gerzon: "I love my life." 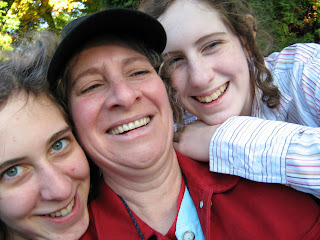 Yesterday, my mother, sister and I got up at 6:00 am, which is nearly unheard of for us! Usually we'd much prefer to stumble out of bed at a much later hour of the morning. 9:00, 10:00, 11:00, 12:00... But I managed the early time without even feeling grumpy about it, because we had to be up bright and early to be at the AQED/QAHBE homeschooling conference in time for our talk on unschooling, which started at 8:30! I was kind of nervous. I'd only written my speech the night before (at least it was short. 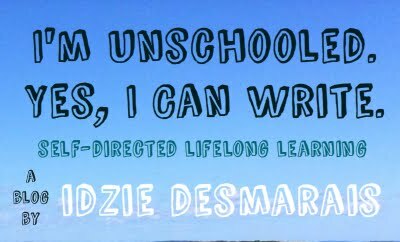 Our plan was always to just give a fairly brief introduction to unschooling, then just answer questions), and I worried about not being prepared enough. Luckily, I've found that public speaking generally only scares me ahead of time. Once I'm actually up there, with everyone watching and waiting to listen to me, right when you'd think I should be feeling nervous, I tend to relax. I'm not sure why it works that way, but I'm not about to complain! So we did our speech, said our piece, then started answering questions. One of the nice people we met was a school teacher who's doing an anti-school, pro alternative education documentary. He was so passionate about alternative education, and so eager to share it's benefits with others! I greatly look forward to seeing the finished project, and my mother and I gladly headed outside in the beautiful sunshine to do a short interview on unschooling. I was happy with what both of us said for that as well! The whole conference was just such a positive experience. Every encounter was so open and genuine. People were friendly, interesting, and interested. We had good conversations, and it's also much easier explaining unschooling to homeschoolers! With a random traditionally schooled person, you have to get through all the assumptions, stereotypes, and misinformation about homeschooling before you can get to explaining unschooling properly. With homeschoolers, you can just get straight to the point! It was just a really rewarding day, and I'm so happy that we were invited to speak at the AQED conference! One of the most common questions that I see being asked around the internet after the lousy segment on Good Morning America, that only focused on what unschoolers *don't* do, is quite simple: "what do unschoolers DO?" Here's my answer: I wander, explore, read, write, discuss, laugh, play, run, hike, create, grow, garden, identify, search, talk, listen, swim, hang out, organize, breathe, gather, touch, work, participate, watch, help, ask, meditate, daydream, wonder, connect, think, learn. "No, really, what do you DO?" I live my life. For most people, the concept of "education" being a separate part of life is so ingrained that they can't see things working any other way. But for me, and for other unschoolers, learning really is nothing more or less than living my life as fully as I can. Life and learning don't have to be separate things. As I wrote a while ago, "Learning IS living, and living IS learning, so why differentiate between the two? If I'm living, I'm learning, and obviously if I'm learning, I'm living!". And I'm quite happy with that, thank you very much. Got up at eleven-something, after going to bed fairly late last night. While I continued to do stuff on the computer, my mother went out to get some fresh bread from our favorite bakery, which I happily ate when she got home. At four or so, Emilie finally stumbled out of bed after pulling yet another all nighter, getting up just in time for our good friend Nick to show up at the door! We let him in (for some reason, we usually do) and in talking about gardening, growing your own veggies, and stuff like that, we finally did what we've been talking about doing for days: start some of our own seeds!! Emi and mom rushed out the door as soon as we were done planting, since they were running late to a musical and cabaret they were attending! Meanwhile, Nick and I headed over to his house where we cleaned out all the dead stuff from his garden, and did a bit of weeding. Gardening like that is so relaxing: getting your hands dirty, seeing the improvement from start to finish... :-) One of the things that we pulled up from the garden were dandelions, roots intact, so I decided to bring them home and eat them! Oh yeah, and I even cleaned up every single bit of mess I made while cooking (and trust me, when cooking, I make BIG messes!). If you're an unschooler, or a homeschooler, or interested in alternative learning, and are even *slightly* involved in any of those communities online, you've most likely heard about the Good Morning America segment on unschooling. Unschooling has been moving steadily into the mainstream awareness in the last few years. I've seen a marked increase in people talking about unschooling since I started paying attention to that type of thing a few years ago. But never have I seen this level of attention. Sure enough, if you read just a few of the 830+ comments on this piece, you'll see just what I was afraid of! There are multiple lovely unschoolers commenting positively in the comments section, but there are also a huge amount of ignorant, uninformed, and downright nasty comments. I always attack schools, never people who go to, or went to, school, but even if I did think schooled people were "losers" (discounting the fact I don't think life is about competition, and don't believe you either "win" or "lose", PLUS know a large amount of seriously awesome schooled folk), I can't imagine ever making such vindictive and cruel comments! Why do people feel a need to do that?? Do they feel better in their mediocre life choices if they can believe firmly and with great smugness that there are people out there who chose MUCH worse paths in life than they did... Is it because, if they admitted that there were better, more joyful ways of living life, then much of their own life has been wasted? Today the Bieglers, the family in the first clip (whom I've met, though don't know well. What I have seen of them has led me to believe that they're intelligent, kind, and caring people! ), where given a chance to speak briefly live on Good Morning America, without all the editing. It was MUCH better!! They were articulate, passionate, and just did a great job. I wish they'd been given longer to speak. Sadly, I'm afraid the feedback from the general public was just as negative. The first video was on Yahoo homepage (not sure if it still is?). Twitter and blogs are abuzz with talk of this new-fangled thing called "unschooling" (I keep patiently pointing out to people that it's not new at all!). I have never seen this much attention paid to unschooling before. And I have to say, it's kind of scary. Suddenly the masses are being exposed to something that challenges everything they've always taken to be The Way Things Are (and The Way Things Should Be). Many people don't seem to be reacting well. Yet, at the same time, I think that publicity is important. I liked reading some comments from Wendy Priesnitz on Twitter, one of which reads: "In the 70s, people were scandalized by idea of homeschooling; now [they're] scandalized by unschooling. This will pass. Evolution happens." I really do think that publicity is good. I WANT more people to know about unschooling, I want more people to understand it, I want more people to accept it, and I want more people to do it. So how can I be against publicity, even if it isn't as positive as it could be? At least we're getting the message out there! And for better or for worse, the message is most certainly out there now. The Bieglers are going to be on the Joy Behar show on CNN tonight, so you might want to tune into that. What do you think of the segments? What do you think of the huge amount of publicity unschooling is getting? Does it make you excited to know more people are finding out about it, or scared it just opens things up for stricter government regulations? P.S. I'm going through old blog posts and comments and putting together an Unschooling FAQs page... I figure I've answered so many questions, I should gather it all in one place to make things easier! I think the fact that I live in the suburbs (of Montreal) still surprises me, even though I’ve been here for almost 6 years. I’ve always felt strongly about issues regarding the environment and peace, but most recently, and perhaps most of all, food. I mention this because suburbia never seemed like the place I could live with a clean conscience with regards to the environment and food. But after university and living in and around downtown for four years, I needed green space (read: yard), clean air and wanted to be closer to the schools where I would be teaching (another story altogether). So after buying a house and spending time making it our own, we (my partner and I) thought we should spend some time on the yard. So how do you ‘green’ suburbia? Slowly we got rid of some of our lawn, planted perennials and built, drum roll please...raised vegetable beds! For me, it felt like a revolution was happening in my own backyard. I felt empowered and I was really going to stick it to the proverbial ‘man’. However, that first year, the vegetable garden wasn’t quite the picture of success we had imagined (we really didn’t know what we were doing), though we did harvest tomatoes, beans and lots of various lettuces. In subsequent years, we varied the types of seeds we sowed and focused mainly on heirloom and organic ones. Thankfully, our harvest has been slightly better every year since. Then, almost 2 years ago, I got pregnant with not one, but two wee ones. So, as you can imagine, last summer’s garden was virtually non-existent (the kids being about 6 mths old at the time), though I did plant an apple tree to commemorate the birth of our lovely babes. Having kids has reaffirmed our need for good organic home-grown food, and the need to get rid of more lawn to grow that home-grown food (not to mention the positive environmental implications of growing your own stuff). We have plans to build a cold-frame using reclaimed (we are proud trash-pickers) to extend the growing season. There is also the dream of owning some chickens and goats and moving to a larger piece of land one day, to expand on this dream of ours to be more self-sufficient. This year we’ve planted or started indoors, so far, 7 varieties of tomatoes, lettuces, sunflowers, melon, peas, broccoli, onions, okra, cabbage and eggplant. If all goes well (and space allows for it) there will be many more seeds planted when the soil warms up. So, what is everyone else planting and what are your reasons for claiming parts of your yards for food? Are your motivations political, environmental or romantic perhaps? What does your food revolution look like? Thank you for this, Genevieve! If YOU have something you'd love to write about (or make art about! ), something cool you want to share, I strongly encourage you to submit it to the DIY Life Zine. It's a project I'm really excited about, and I'm so looking forward to seeing all the great stuff people come up with for it! And a couple of days ago, I realized something interesting: in the specific sub-genre of teenage fantasy, the main characters are usually resourceful, very independently capable, yet also able to function well as a part of a group, brave, and just generally a person to respect. This finally clicked with me after reading a wonderful book this past week, entitled Runemarks, by Joanne Harris. Our heroine, Maddy, makes no effort to obey the arbitrary rules of her elders, or to follow the norms of the very controlling culture she's born into. When at age 7, she finds someone she considers to be an appropriate mentor, she demands to be taught how to use her magic, and years later, at age 14, she goes behind the back of that same mentor to go on a dangerous journey in an attempt to save his life. This book told a great story, but more than that, it was a perfect example of the respect for young people often showed in young adult fantasy fiction. Not by any means always, but certainly often. In how many young adult fantasy books do you find the (young) main characters being constantly shadowed and guided by their parents, teachers, or other guardians? How an Adult Used a Teen As Their Puppet to Save The World wouldn't make a very engaging plot now, would it? So this leads me to something else: if so many people can happily write about teens as such responsible, strong, and interesting people, and if so many adults can cheerfully buy these books for their teens, and if so many teachers can reccomend them, they must, on some level, realize that real life teens can be just as responsible, and strong, and interesting people as those in books. Because even when set in the most fantastically unbelievable worlds, all good fiction has a feeling of authenticity to it. Good fiction has to feel *real*. If the idea of teens doing such amazing things seemed entirely unathentic, wouldn't people comment on it more? Wouldn't the sheer impossibility of it turn people off? I love writing on this blog, but sometimes, I just don't have much to say. And there are so, so many wonderful people out there with terrific stories, opinions, and ideas to share. So why not have my very first guest post? I find that idea pretty exciting! What to write about? Something that you think will be relevant and interesting to the readers of this blog, and very importantly, something that's relevant and interesting to YOU! This is open to you whether or not you have your own blog. If I get more than one entry, I'll choose the one I think would work best for this blog. I also reserve the right to turn down any posts that I just don't think would work well. I may do basic editing on the chosen post, but if I change anything more major than fixing spelling mistakes or adding a comma or two, I'll send it to you first for approval before posting. It must be a post that has not previously been published anywhere online. Send all inquiries and posts to open.eyed.slave@gmail.com! Wow, that seems like a lot of guidelines for a simple guest post, but I'm just trying to answer as many questions as I can before they come up! Unschooling and Skipping "Higher Ed"
"Going against the middle class/mainstream entrenched belief that to have a successful life you have to get higher ed can you define your idea of what success means?" The entire interview can be found here! Beatrice is looking for other stories of grown unschoolers who are choosing/chose not to go to college or university, so if you want to share your story, drop her a line at radiofreeschool@gmail.com. I talk a lot about finding community. I think community is so very important, both to each individual, and to the overall well being of the world (keeping people separated, if only in their minds, is a good way of making sure they never get together to change things, in my opinion.). But I think when I say I need community, what I picture is "community" suddenly appearing, fully formed, out of nowhere. And now that I've realized this is the image in my mind, I also realize that's a bit unrealistic (just a bit.). I'm bemoaning the fact that something pretty much impossible isn't happening, and letting that negatively affect my life, and my happiness. And now that I can see that, I find that I'm already finding community. Every single time I talk to the nice woman selling vegetables at the farmers market, or arrange to meet a new person (or randomly meet a new person), or attend a talk at the local health food coop, I'm building community. Community isn't something you find ready made, straight off the rack. It's something that you find, bit by bit, in smiles and tentative first conversations and in being brave enough to just GET OUT! Out of the house, out in new places, out of your comfort zone (it doesn't have to be far. Just sticking my toe out of my comfort zone feels good. Edging past the invisible lines I've drawn. Not enough to terrify me, but enough to feel pride in overcoming the small rush of fear.). I've been feeling so optimistic lately, taking such joy in the Spring. I feel like I'm moving in the right direction, if slowly, and that things will work out. They'll be okay. I hope those feelings are right! P.S. There's a new poll on the sidebar, open for a bit over a week only, so vote now! I've read plenty of anti-school stuff, plenty of essays by John Taylor Gatto, and I've always believed what he said to be true. But it's an entirely different thing to see (read) it for myself! "The fundamental patterns in any society are held together by tacit ideological assumptions. In schools, some rules are not overt, but they serve to organize and legitimate the activities of teachers and students. Much of what the school teaches and the students learn does not appear in the formal curriculum. Successful school performance requires that the student learn what are considered important and useful skills and knowledge. But students must also have the skills to uncover the hidden rules and expectations that affect their dispositions, identities, and personalities. For example, schools emphasize conformity, deferred gratification, achievement, competitiveness, and obedience to authority. Students must understand the social and other dimensions of this hidden curriculum. The hidden curriculum refers to the tacit teaching of norms, values, and dispositions that occurs through students social experiences in routine school activities." Isn't that interesting? I certainly think so. Often, when I make a comment about schools teaching conformity, or obedience to authority, I'm told it's not *really* like that. That I've gotten it wrong. But really, if even teachers in training are taught that this is so, I think it's probably pretty damn accurate! As Spring is now here, I think this poem, written on February 1st, is seasonally appropriate..
Do you remember when we used to catch tadpoles? On March 11th, angry and frustrated with the state of the world as I often am, I wrote this poem, entitled Broken Pavement. Mother Culture holds us close. Waving in the passing breezes. By a stream that fish still follow. The stars will find me. And finally, I've been having trouble writing any poetry whatsoever lately, so though I don't even like the finished product much at all, I was very proud of myself for managing to get over that block and write this poem yesterday! blocking out the world with two small earbuds. strange streets and breathless laughter. reality seems so mundane, sometimes. the sunshine smelled like adventure. I love love love comments, love reading what you have to say, your experiences, opinions, stories. However, I also hate debating, and much prefer to share instead of argue, so I'd appreciate it if you refrained from trying to start debates (I don't consider sharing opposing views to be "trying to start debates". I just ask that people please respect my desire to not get involved in arguments! I love respectful discussions. I'm not so fond of arguing!). Please keep all comments respectful! Remember that there's a real person behind those words on the screen, be they mine or another commenter, a person that can be hurt by unkind words. I do not delete comments expressing differing or opposing views, but I do delete comments that are overtly sexist, racist, homophobic, or otherwise hateful in nature. Thanks for your understanding, and I'm really looking forward to hearing what you have to say!! If anyone has any other ideas for blog improvements, I'd love to hear them! Just comment here, or drop me a line at open.eyed.slave@gmail.com. When I was six years old, at a summer fair with my mother, I came across a table on animal rights, with photos (maybe a video playing too?) of how animals are treated and killed in slaughterhouses. I don't remember this myself, or at least I don't think I do. It feels like one of these phantom memories, lodged in your head from hearing a story so many times, you can *almost* remember it yourself... And apparently, I instantly decided I would stop eating meat. And I gave almost all meat up instantly. "Almost all" because, well, I was six, so hotdogs and McDonald's chicken mcnuggets were hard for me to give up. However, even the allure of those wore off, and by age eight I was completely vegetarian. As you can tell, it was originally for ethical reasons. As I got older, I went through various reasons (health, ethical, environment, meat just didn't appeal to me), but whatever the reason I gave when I was asked why I was vegetarian, I have been since age eight. I got used to all the stupid questions and comments pretty quickly, and just learned to smile vaguely and ignore anything I found insulting. Recently though, there's been lots of talk I've seen online among more radical people: very anti-vegetarian stuff coming from anti-civ anarchists, that I honestly find slightly hurtful. I think it stems from Lierre Keith, author of The Vegetarian Myth, doing lots of talks recently, bringing up a lot of very interesting things to think about, but also making a lot of people very angry and defensive (even to the extent of harassing and harming her). But, here's the thing: I want to read her book!! I've listened to parts of her talks with interest. I want to learn more. Yet, I'm vegetarian. And I don't plan to stop being vegetarian anytime soon. The anger directed at ALL vegetarians is completely misplaced, as far as I'm concerned. Attack the vegetarians and vegans who have actually been assholes, not ALL vegetarians and vegans! This goes against something I find very important, and try very hard to do myself, and that is to attack the ideas/beliefs/institutions, not the people. Or if I really do feel a need to condemn individuals, I make sure it's the specific individuals who I feel have done wrong, not others who simply share some of the same beliefs and ideals. But getting back to the topic of my vegetarianism. If I believe as other anti-civers do, that agriculture (the destruction of all life on a piece of land to plant monocrops) is harmful and unsustainable, why do I have the diet I do? Well, it's been something I've been thinking about a lot lately, and I think I've come up with the basics of it. Firstly, it's both habit at this point, and something I feel good with. I don't feel a lack because I'm not eating meat. When I'm eating healthy vegetarian food I feel healthy! Secondly, if I was ever to eat meat, it would only be meat from animals I knew had been treated well and killed with respect. That's both expensive and often hard to find, unless you hunt yourself. Which brings me to another reason I don't eat meat: I have this feeling that whatever I eat should be something that I myself would be willing to harvest or kill. Pulling up a carrot is just as surely killing as shooting a deer, and I recognize that fact where I think too many others don't. But I can bring myself to kill a carrot where I can't bring myself to kill a deer, so I eat carrots where I don't eat venison. I wouldn't kill a chicken, so I don't eat chicken. My feelings may change at some point, but that's where things are right now. I try to eat as much organic, locally grown produce as possible, both for health and sustainability reasons (really, the two are the same things! Unsustainable practices means unhealthy or dead humans. ), and this year I want to grow more veggies myself. I'm also experimenting with my diet this summer, seeing how I feel cutting out virtually all grains and processed foods from my diet. But for now, meat is not going to be a part of my diet, and I'd really appreciate it if I wasn't made to feel bad about that fact! P.S. I want to make sure, because I'm not sure how what I said about others views on eating meat came across, that all the anti-civers I've ever met (online and in real life) are strongly against factory farming and animal abuse. Most just see eating meat, that's either hunted or raised kindly, as part of a sustainable diet.